The smallest Volkswagen is becoming yet more colourful and sharper still. Late this summer the second series of the up! will be launched in Europe – with newly designed body panels, new colours, new wheels, new individualisation options, new equipment, a completely redesigned interior, a new infotainment system and an outstanding new engine that offers a significant boost in performance and torque. Volkswagen is presenting the new version of the up! to the public for the first time at the Geneva Motor Show. The up! has been one of Europe’s most successful small cars for five years. In countries such as Germany and the Netherlands it is the number 1 in its segment. However, the up! has also enjoyed great success outside Europe, with strong performance in markets such as Brazil, Japan and South Africa. New design and interior elements. Every version of the up! presented in Geneva will come with new headlights (with LED daytime running lights as standard), new bumpers, a prominent rear diffuser, newly designed tail lights, new exterior mirror housings with integrated indicator lights, new colours and décors for the dashpad (dashboard styling panel) as well as new seat designs. Just like the larger Volkswagens, the latest up! is now also available with the “Light and Sight” package (“Coming home” and “Leaving home” functions as well as rain sensors). Fog lamps will now also feature cornering lights. 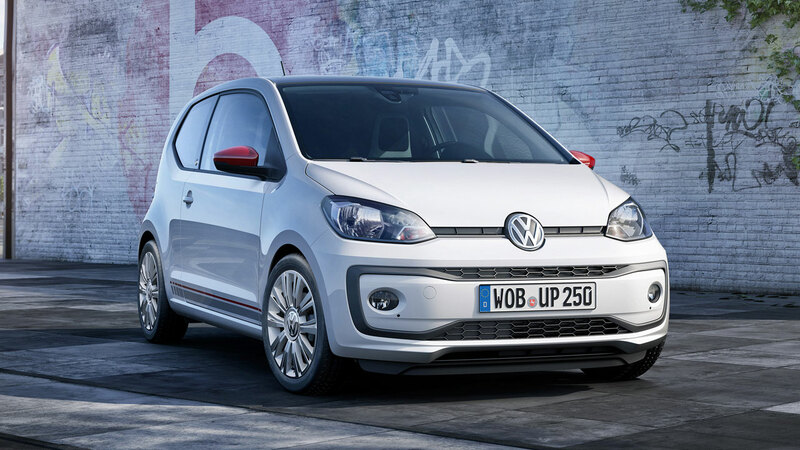 Volkswagen is also offering the up! with a multi-function steering wheel and Pure Air Climatronic (automatic air conditioning) for the first time. Pure Air includes an air quality sensor with an active biogenic filter that keeps the atmosphere in the cabin at a consistently high level and prevents pollutants, fungal spores or allergens from entering via the system. New turbo engine. The outstanding new 1.0 TSI engine available in the new up! offers an efficient and engaging drive. 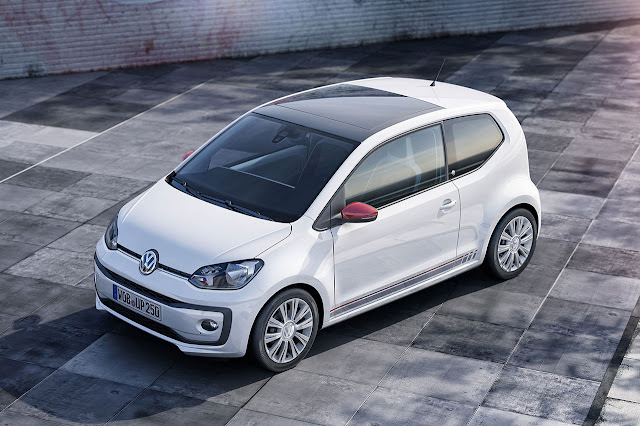 This turbocharged direct petrol injection (TSI) delivers a powerful 66 kW/90 PS. The maximum torque of 160 Nm is available from 1,500 rpm. The three-cylinder engine is the first turbo for the up! and the most powerful motor available in the model to date. It delivers truly dynamic performance with a top speed of 185 km/h, and takes just 10 seconds to accelerate to 100 km/h. This up! even strives to match the driving performance of the first Golf GTI. Its dynamism is paired with high efficiency: 4.4 l/100 km (equating to 102 g/km CO2*/*forecast value) mean that the up! 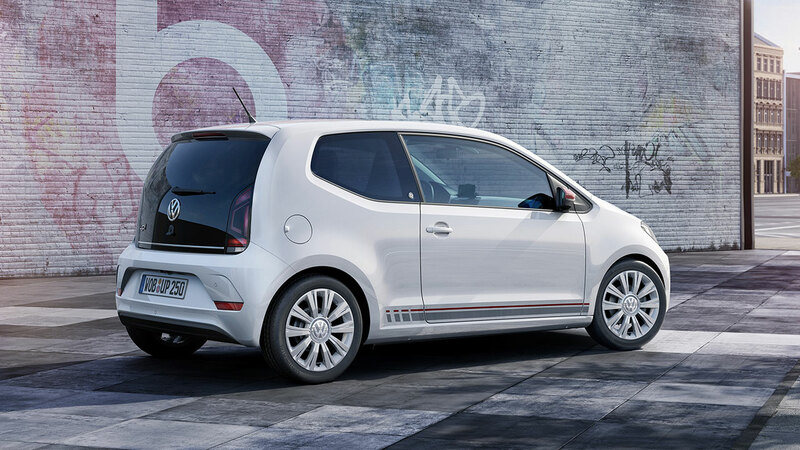 1.0 TSI can cover up to 800 km on a single tank of fuel. The sporting nature of the most powerful new up! is emphasised by the visible exhaust pipe. New smartphone integration. Another innovation in the new up! is its smartphone integration. Just connect the smartphone above the dashpad, pair via Bluetooth and it becomes an infotainment system with navigation system and on-board computer functions, thanks to the Volkswagen app. New up! beats with a 300 W sound system Coinciding with the market launch of the new up!, Volkswagen is offering a new equipment version: the up! beats. This is a car whose overall concept is defined by sound because it comes with a 300 W sound system – from the American audio specialists BeatsAudio™ as standard. In this case, smartphone integration also comes as standard. More colours and décor. The up! is a dynamic little car that makes mobility fun. 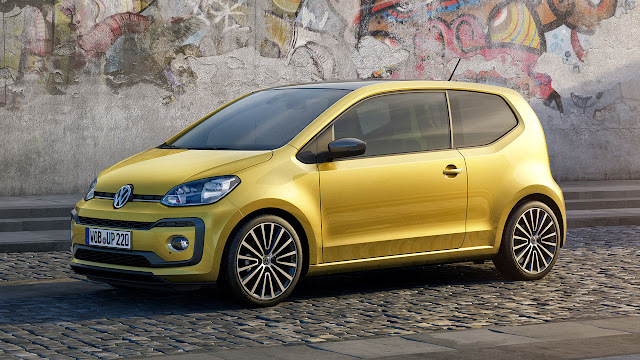 With the new series, Volkswagen is putting the spotlight even more clearly on the individuality of each up! So the up! presented in Geneva comes with a choice of 13 body colours, 9 exterior decals, ten new dashpad designs, three roof colours, three design packs, two colour packs and two basic colours for the interior trim (“Titanium Black” and “Ceramique”), coloured alloy wheels and individualised-colour ambient light available for the top-of-the-range models. Exterior colours. Of the 13 colours available, seven are new: “Teal Blue”, “Coral Red”, “Costa Azul” (blue), “Honey Yellow”, “Edelweiss” (white), “Blueberry” and “Savanna Gold”. Dashpad designs. Depending on the body colour, interior trim and model, up! buyers can choose from a selection of ten new dashpad designs, using an innovative labelling process that allows an even greater degree of customisation. More engines. Previously the range of engines comprised two three-cylinder units with multi-point injection (MPI) that deliver 44 kW/60 PS or 55 kW/75 PS. This duo of 1.0 litre petrol engines has now been augmented by the sporty new 1.0 TSI (66 kW/90 PS). As a zero-emission vehicle, the e-up! cruises through the city (60 kW/82 PS). Drivers who prefer natural gas can still opt for the eco up! (50 kW/68 PS). take up! In future, the base version take up! will come with features such as LED daytime running lights, LED licence plate lighting, door mirror casings with integrated indicators, a chrome trim strip between the headlights as well as remote-controlled central locking. The gloss black application on the centre console (with heating and ventilation controls; plus optional climate controls and radio) is framed by a narrow chrome strip. move up! In contrast to the first series, the move up! is the first model in the revised range to feature the newly developed “Composition” radio system, a USB port, an enlarged multi-function display and a customised “Black Cube” design dashpad as standard. high up! In the high up! the additional features include a newly developed ambient lighting system (white), a customised dashpad (with a choice of three versions of the “Pixels” design), heated front seats, a multifunction steering wheel, six loudspeakers, fog lamps with integrated static cornering lights and the new 15-inch “Radial” alloy wheels. Air conditioning still comes as standard. cross up! New features on board the all-terrain version cross up! are the “cross-look” dashpad and ambient lighting (orange). e-up!. The new e-up! is characterised by the new “Shark Skin” design dashpad and ambient lighting (blue), a light and rain sensor as well as the new smartphone integration feature. More equipment packages. Volkswagen is also offering three new roof packs designed to match the paint schemes – including roofs painted in contrasting black, white or grey as well as contrasting colour door mirror caps and tinted rear windows. Other additions to the range are three design packs, including a dashpad, design decals for the exterior, and contrasting door mirror caps. The range of equipment packages is rounded off by the colour packs, with the up! being given a final eye-catching flourish – along with the contrasting colours “Hot Orange” or “Gold Beige” – with 16-inch alloy wheels, design decals for the body and matching door mirror caps. 300 watts from Dr. Dre. The American audio specialist Beats Electronics – founded in 2008 by the rapper Dr. Dre – made a big impact on the music scene, primarily with its headphones. Now the Californian company also offers a wide range of other technologies, including full in-car sound systems. Volkswagen is unveiling these BeatsAudio™ sound systems for the first time at the 2016 Geneva Motor Show in the Polo and in the new up!. In the case of this city specialist, this results in a completely new equipment version: the up! beats. The sound system’s 300-watt and 8-channel amplifier is fitted with a digital signal processor (DSP). To ensure crystal-clear sound, the system has seven high-end loudspeakers distributed around the interior: two tweeters in the A-pillars, two woofers in the front doors, two broadband loudspeakers in the back as well as a subwoofer integrated in the spare wheel well, which delivers powerful, punching bass tones. up! beats equipment. The up! beats also has added customised flair thanks to the new 15-inch alloy wheels, special beats design decals and contrasting colour door mirror caps. In the interior, an individual dashpad, a special door sill plate as well as colour-coordinated seat belts to match the new equipment version give the car a very distinctive look. The up! beats also comes with smartphone integration and ambient lighting (white) as standard. Two new radio systems. Volkswagen has given smartphone integration a complete make-over. A new infotainment generation has been developed: the Composition system, with a 3.1-inch monochrome display, and the top-of-the-range Composition Phone system with a 5.0-inch colour display. Both of the systems feature a twin tuner, AUX IN connection and SD card slot. The base system also has a CD player, while Composition Phone has a Bluetooth interface with hands-free function. The Composition Phone system also offers a rear view camera, available for the first time in the up! As an option, both of the systems can be supplemented by a DAB+ (digital radio receiver), the Sound Plus package (with six loudspeakers) as well as a USB port (in the centre console). The Composition Phone system is also available with the new smartphone integration feature and the BeatsAudio™ sound system. Smartphone integration. “Maps + More dock” can be used to integrate current smartphones, running either Apple or Android, into the Composition Phone’s control system, simply by connecting the smartphone above the centre console and pairing it with the radio system via Bluetooth. The Volkswagen app “Maps + More dock” can now be used to run “Navigation” (offline navigation without roaming costs, 2D or 3D map mode), “MFA” (multi-function display with vehicle data), “Phone” (with hands-free kit), “Think Blue. Trainer.” (energy-saving tips), “E-charging Manager” (in the e-up), “Car Function” (various vehicle functions), “Media Control” (access to music details, display title, artist and cover, search function with handwriting recognition) and “Radio Control” (selection of FM, AM or DAB+; display, search and save radio stations). The smartphone integration system also includes a USB port that can be used to transfer data or for charging.